BLUE BELL, PA – Henkels & McCoy Group (HMG), a leading privately held utility construction and engineering firm providing critical infrastructure for the power, oil & gas pipeline, gas distribution, and communications markets throughout North America, has been recognized by Engineering News-Record (ENR) as a Top 600 Specialty Contractor. HMG placed eighth on the list for 2018. 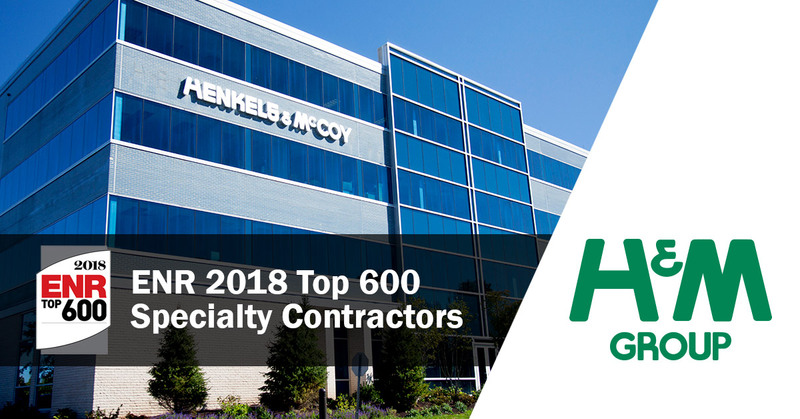 HMG is a mainstay on the Top 600 Specialty Contractor list, consistently holding a top ten position. As the builders of the strongest infrastructure networks, HMG is well-prepared to continue its mission to create a better connected world, bringing reliable energy, communications, and utilities to people everywhere. For more information, please visit http://www.henkels.com/. The Top 600 Specialty Contractor list appears in the October 22, 2018 issue of ENR, one of the most recognized magazines of the construction industry. The annual listing ranks leading specialty contractors, both privately and publicly held, based on revenue generated during the previous year. Read more about The Top 600 Specialty Contractors List http://bit.ly/ENRTopSpecialtyContractors.